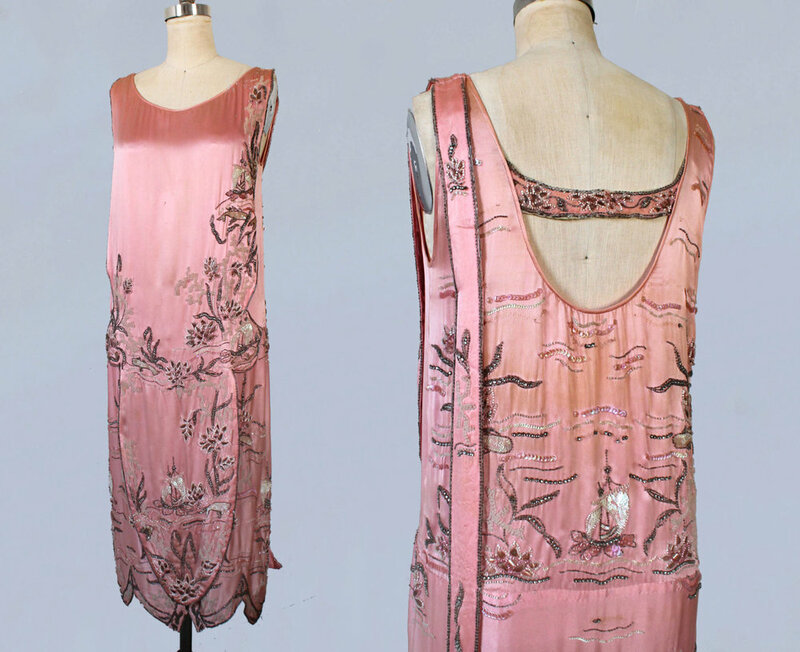 Beaded 1920s gown. Courtesy Guermantes Vintage. The dark water was not a good sign. I was soaking a 1970s yellow and black dress in a plastic tub, in mild temperature water mixed with a little detergent. I had two goals—to alleviate some of the terrible smell and fade some staining in the bodice. The dress was a sturdy fabric, I threw it in its bath without much thought. I figured the worst-case scenario would be the dress was as smelly and stained as before. But now the water was black, the dress hardly visible. The first feelings of unease started going through my mind, coupled with reassurances—maybe the dress was just really dirty, or had never been washed and the dye was running. I pulled the dress out to find that I had screwed up, majorly. The detergent worked too well, and the black of the skirt had stained parts of the yellow bodice where the fabric touched in the water. The yellow bodice now had a tie-dye appearance and was beyond repair. This incident was my first “cleaning disaster” as a vintage seller. I was living with my parents after finishing my Master’s degree in Dress and Textile Histories, and I had started a small online vintage shop to inject some fun into days filled with job applications. Vintage is both the remnants of the fashion industry (what survives) and the inspiration for where the industry could go next, an undercurrent that attracts those of us who can’t resist what is old and pre-loved: me to a T.
I myself have been wearing vintage for over a decade, and with my new degree from graduate school I felt confident that dating and describing clothing wouldn’t present a challenge. After all, one of the options listed in the “career prospects” section of my graduate degree’s informational website was “vintage seller.” As an intern, I had dressed and undressed mannequins with the collections of some of the most famous museums in the world—surely I could handle taking measurements and uploading shop photos. The 1970s dress incident was a sobering but necessary reminder not to get too big for my britches. I was grateful that I had not ruined a particularly amazing piece of vintage and that I was only a few dollars down the drain. However, I felt a mix of embarrassed and disappointed in myself. I should have known a detergent that strong wasn’t necessary, I should have known to check on the dress sooner, and I have should have known that my fancy degree and love of a good 1940s dress didn’t make me The World’s Greatest Vintage Seller Who Was Never Going to Make a Mistake. I promised myself I would proceed with more caution. I now work with a team selling vintage full-time, and while every aspect of the job is more intense at this full-time level, I have been amazed and consistently humbled by just how much care goes into cleaning, storing, and essentially archiving the pieces in our inventory. The process starts with clothing being unpacked or unloaded from wherever it was found and ends with everything cleaned, repaired, inventoried, and hung in the proper place. Everything, from vintage Chanel to men’s 1980s t-shirts, is photographed and documented, researched and examined. A wall of acid-free tissue paper waits ready for sequined and beaded pieces that need to be folded. Men’s ties lie in coded bins, velvet dresses from the 1930s hang on the end of racks, so the velvet is in no danger of being crushed. At the end of the work day, when I turn off the lights, I’m saying goodnight to a warehouse filled with thousands of vintage items resting in their climate controlled waiting room, the plastic of the garment covers rustling in the air conditioning. Blue lamé 1930s gown. Courtesy Guermantes Vintage. It is not just humbling but deeply intimidating to handle clothing this way, in an environment where my hands touch dozens of vintage pieces daily. I was trained to handle clothing in a museum setting, safe in the knowledge that I was a lowly intern who was heavily supervised. There was not a lot of opportunity to make mistakes, as the choices regarding conservation, storage, and handling had been made for me. Sure, getting to hold seventeenth century men’s shoes was deeply moving, as interacting with the past often is, but all I had to do was pick up the shoe, mark down an acquisition number or condition report, and put it back in its spot. There was a mountain of paperwork and procedure between me and making any kind of decision that would impact the clothing. This is certainly only true for my specific experience as an intern at this museum, but I knew it would take me years of working my way up through a similar institution to reach a point where I made those kinds of curatorial decisions. As a vintage seller, I reached that point in seconds: I decided I was going to sell vintage and then I was a Vintage Seller. For better or for worse, I was now responsible for every piece of stock I had. It wasn’t until I made my first mistake with the 1970s dress that I started seriously thinking about the responsibility—or lack thereof—we vintage clothing sellers have to these clothes. When I pulled the accidently tie-dyed dress out of the water, there was no one to berated me for my mistake (expect myself). There was no one to answer or explain myself to, no damage report or paperwork to be done, no punishment or negative consequence. What I was left with was the weird, specific guilt of leaving an object in worse shape than when it came into my hands. I’ve connected with more vintage sellers since my dress incident, and there is a consensus that ruining a piece of clothing results in a terrible feeling (it happens to most sellers at some point in time). However, at the time I worried this was a sign that I wasn’t cut out to sell vintage—if I couldn’t keep a seemingly indestructible piece of 1970s clothing from disarray, how on earth was I supposed to handle more delicate pieces? Who put me in charge? That’s the thing about selling vintage: we sellers put ourselves in charge. Any decision to go above and beyond—or take a shortcut—is often a solo decision. There is no governing body of vintage sellers that makes sure we sellers follow the rules, and a standardized set of rules or guiding principles doesn’t exist in the first place. There is not an “official” way to do anything, and the result is that the vintage selling community is diverse in its practices and of varying opinions regarding almost every aspect of the job. My dress incident was a prime example of solo-decision making gone wrong, but during my time in the vintage selling community I have been so amazed by the ways in which both individual sellers and sellers as a group go above and beyond to share, document, and take care of their collections. One of my favorite vintage sellers, Guermantes Vintage, has recently created a “Museum” section of her website. Click to enter the museum and you find “An online fashion resource cataloguing the Guermantes collection,” with both featured collections and categories divided by decade. With almost 50,000 Instagram followers, Janine (the owner of Guermantes Vintage) is known for finding amazing and unusual pieces from the 1920s to 1940s. Her Instagram account alone is worth following, but with the creation of the Guermantes Museum she has produced an amazing resource for anyone curious about those specific decades, or anyone who just likes looking at beautiful 1920s lamé dresses. In addition to individual sellers, communities and organizations exist that provide support to and resources for sellers and vintage enthusiasts alike. The Vintage Fashion Guild (VFG), founded in 2002 by a group of vintage sellers, describes itself as an “international organization dedicated to the promotion and preservation of vintage fashion.” The VFG offers resources covering vintage labels to fabric and fur identification, and all the information is free and available to non-members. In a slightly more informal capacity, numerous Facebook groups exist for specific periods of both menswear and womenswear, and these are spaces where sellers can post questions and seek advice. People come to vintage selling from all different career backgrounds and with varying levels of historic clothing experience. In many ways this is what makes the field so fun, but this also accounts for the differences in how sellers think about and take care of the clothing in their collections. While in my Master’s program, I took several classes that were part of my university’s textile conservation program. When I think about what obligation I and other sellers have to the clothes we work with, I’m reminded of the truth, so apparent in those conservation courses, that informs so much of our experience with clothing. Clothes are not meant to last forever. This is a fact, even accounting for the hard work of conservation experts around the world. One of the reasons I and many others love buying vintage clothing is because you can get such high-quality clothing at a much better price than buying new. Anyone familiar with vintage can attest to how beautifully a 1940s day dress can hold up after roughly eighty years. However, even the most well-constructed and well-taken care of textile is meant to one day pass beyond human care. We do our best with the shape the garment is in, and we rely on other methods of documentation to round out the story once the garment no longer exists. In the vintage selling world, pieces are mended and cared for so that they can go back out into the world and be worn. Browse Etsy and you’ll see plenty of things marked as “for study” or “for display only,” but most people who buy vintage wear it with joy. This of course shortens the length of the garment’s life, but that is part of the business. I am very much of the opinion that clothes are meant to be worn and loved, and I would rather have pieces be on the body and enjoyed than tucked away out of fear. Most vintage sellers I’ve interacted with share this sentiment—we wouldn’t be able to part with such a large volume of beautiful and rare things if we didn’t think they deserved to be worn. Upcycling, which involves people taking vintage pieces and remaking them into something new, is common in both vintage buying and selling communities. Opinion varies on upcycling and similar “repurposing” efforts, as I know sellers who price their pieces high just to avoid people buying with the express purpose of upcycling. This past Halloween season, there were calls on those vintage seller Facebook pages for people to check out their local thrift stores and “save the vintage” that gets advertised as costumes. Someone posted a picture of an amazing 1950s wedding gown in great condition that was “bloodied” in-house at the thrift store…meaning the store covered the dress with fake blood and then put it out to sell (not exactly upcycling, but in a similar vein). Gold lamé 1920s gown. Courtesy Guermantes Vintage. Most commenters were outraged that the dress had survived this long only to be ruined by what looked like roughly a galleon of dyed corn syrup. A part of me was sad about the dress, but it is an incredible dress that would make a killer Halloween costume. Maybe the person who buys it will come up with an amazing costume idea, and if they can wear the dress and love it, and, most importantly, spend the evening feeling good in it, then I think that’s a win. Clothes are not meant to last forever. That is how I frame my relationship to the garments in my care: I’m their guardian, in a sense, for the time being, but they will pass out of my hands to other homes and lives. My control over the care of these pieces is limited and temporary at best. When I started thinking about vintage sellers and our responsibility to our collections, I was not just reflecting on what that responsibility looks like—I was genuinely thinking through the possibility that while we should be responsible, there is really no one to stop us if we act otherwise. Technically, I could take a bunch of 1930s evening dress out into a field, set them on fire, and I wouldn’t be breaking any rules. Slightly ridiculous, I know, but I did think through that scenario as an extreme example. While even the best sellers make mistakes, I’ve yet to encounter anyone who would purposefully damage a textile. I think someone who thinks like that would not voluntarily become a vintage seller. The point, then, is not really about whether we do or don’t have a responsibility to these things, or what that responsibility looks like. It’s never going to look the same for any two sellers, because concepts of “taking care of” our stock are so informed by one’s personal relationship to clothing. We carry out this responsibility in our own ways, and that’s why I’m so excited to see the different approaches sellers take to preserve, document, and share their collections. Not only do we all benefit from these shared resources, but people studying these items in years to come—perhaps when the items no longer exist—will see in those differences just how many ways there are to care for and appreciate clothing. We sellers might not have the same reaction to a bloodied 1950s wedding dress, but I hope that in our differences we’re creating future resources that are as unique as the clothes in our care. I think that, just like a good 1920s lamé dress, is something to celebrate. Virginia Knight is a vintage clothing seller and freelance writer. She graduated with a Masters of Letters in Dress and Textile Histories from the University of Glasgow in 2016 and currently lives and works in Asheville, North Carolina (where she can usually be spotted about town in vintage clothing).